Navy FIELD is a Massively Multi Player Online Tactics Game. 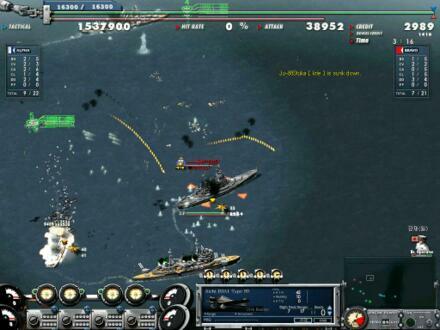 Navy FIELD redefines the concept of online multi-player gaming. This type of game has never been developed before and will provide players with a totally new gaming experience. Navy FIELD is currently marketed and sold in Korea, Japan, Hong Kong and China. Navy FIELD is based on naval combat during WWII. One of the best features of Navy FIELD is the presence of graphically engineered warships, weapons, fighters, and bombers that actually existed in that era. Players will have the opportunity to see how the actual naval guns, torpedo launchers, Fire Control Systems, and engines looked and operated. Players earn game credits for ships and gain experience points for sailors as they engage in war-like battles. Navy FIELD offers special missions so that beginners can get the feel for commandeering ships and managing a crew before actually participating in battle. Four nations are represented in the game: the US, British, Japan, and Germany. Navy FIELD has 95 different types of warships including Frigates, Battle Cruisers, and Aircraft carriers and a total of 75 positions for sailors. The massive naval battles that involve up to 128 players (64 vs. 64) have to be one of the most impressive features of Navy FIELD. Players are asked to utilize their cooperative and tactical skills in developing effective strategies with team members to lead overcome the enemy and lead their team to victory. Navy FIELD offers players the opportunity to enjoy the fun and excitement of intense WWII Naval battles online with ships, aircraft and weapons that emulate the actual hardware used during that era. Although you might experience better graphics and sound quality in other games, the developers at SD EnterNET believe that Navy FIELD offers the very best in quality gaming.